Two British crews hold the highest scores after day one of racing in Bermuda at the Argo Group Gold Cup, the penultimate event on the Alpari World Match Racing Tour, in what race pundits believe could turn into a clash of the Anglo-Saxon match racing titans. 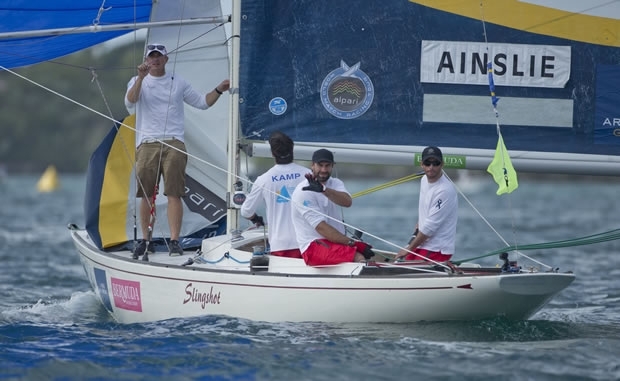 In one corner is the GAC Pindar team of four time Tour winner and 2013 Tour leader, Ian Williams. In the other is the high profile crew of the world’s most successful Olympic sailor, Sir Ben Ainslie, fresh from his turn-around America’s Cup win with Oracle Team USA in San Francisco. Both crews ended the day unbeaten on four wins. “It was great fun,” said Ainslie, who is competing to help raise funds for the Andrew Simpson Sailing Foundation, named after his lifelong friend Andrew ‘Bart’ Simpson who died in a sailing accident earlier this year. “We were a little bit rusty on the whole boat on boat situations and the starts,” Ainslie continued. “We got a lot better through the day with the starts. But we made a few mistakes. While Ainslie beat Bjorn Hansen, Phil Robertson, Nicolai Sehested and local sailor Joshua Greenslade, Williams won against Chris Steele, Pierre Antoine Morvan, Will Tiller and his old foe Mathieu Richard. Williams’ most action-packed race was against Morvan. After Williams’ GAC Pindar crew picked up a penalty in the pre-start, they led around the course, but by not enough to carry out their turn. Their only recourse was to slow up and, as the two boats approached the finish line, Williams luffed, holding the French team up to windward. The French crew thought they could roll over the top of Williams’ boat and attempted to bear away, but failed to make it. For this they received a red flag penalty, requiring them to carry out their turn immediately. Ainslie and Williams were racing in Group 2, the 20-strong fleet having been divided up into two groups of 10 for Qualifying. While their group enjoyed a pleasant afternoon weather-wise, the same could not be said for Group 1, this morning. As the second flight of this came to a close, an intense squall brought with it a deluge. At the end of day one, Minoprio, currently joint second overall on the Tour’s 2013 leaderboard, leads Group 1 on 3-0. However in the brisk conditions with winds gusting above 20 knots at times there were several gear failures on the Royal Bermuda Yacht Club’s fleet of classic 33ft long International One Design yachts. Particularly unfortunate was Keith Swinton’s Black Swan Racing that was leading Italian Simone Ferrarese’s team in Flight 3, only for the splice in their mainsail halyard to give way on the second beat. Swinton’s crew swapped to a different boat for the next flight only for the halyard to go on that boat too. Despite this set-back, Swinton had a good first race. In this he had managed to place three penalties and a subsequent black flag on his opponent, Lance Fraser, beginning with the 20 year old Bermudan sailor failing to keep clear at the first weather mark rounding. Defending Argo Group Gold Cup champion, US Virgin Islander Taylor Canfield didn’t get off to the best start. Currently on 2-2, his USone team lost to Francesco Bruni’s Luna Rossa crew and Johnnie Berntsson’s Stena Sailing Team. Johnie Berntsson, the 2008 Argo Group Gold Cup winner won both his races today, against Stanczyk and Canfield. In the first he started with a penalty but extended far enough away during the race to carry out his penalty turn successfully. In his Canfield match, he led around the entire course. Qualifying resumes tomorrow but significantly will kick off with ‘the Battle of Britain’ when Ainslie and Williams go up against each other.